Guilford Orthopaedic and Sports Medicine Center makes a commitment to excellence by providing quality care throughout all phases of physical rehabilitation. It is our objective to offer patients comprehensive physical therapy services with a qualified professional staff that promotes individualized programs designed to facilitate return to optimal function. The staff uses both a problem-solving and an integrated approach towards the evaluation and treatment of physical dysfunction. We emphasize a team approach to treatments, and patients are required to take an active role in their recovery. Our physical therapy center is equipped with state of the art therapy equipment well-suited for the wide range of therapeutic and strengthening needs of our patients. 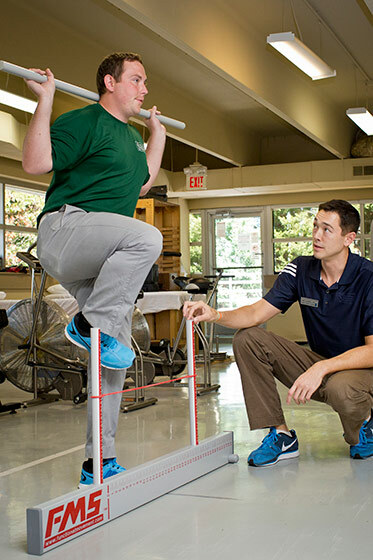 A professional staff of licensed Physical Therapists, Physical Therapist Assistants and Licensed-Certified Athletic Trainers have the individual backgrounds, experience and knowledge to lead patients through our treatment programs. Cancellations must be made 24 hours in advance of your scheduled visits so that we may use that time for other patients who are waiting to be seen. In cases of inclement weather or illness, we do not enforce this policy. Applicable payments for services are expected at the end of each treatment unless prior arrangements have been made. See Accepted Insurance under PATIENT EDUCATION for insurance information. What Do I Wear for a Physical Therapy Treatment?